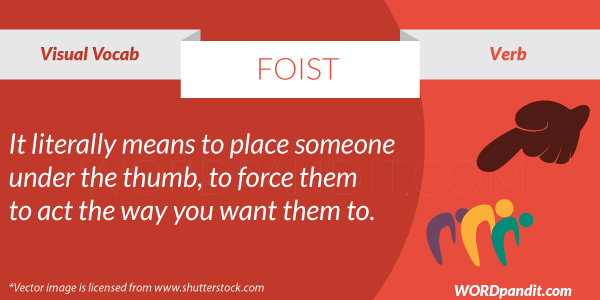 The word Foist is a verb. It means to impose something surreptitiously or by coercion and fraud. It is also used when someone or something is trying to pass off as genuine or worthy but is a fake. It was first used in 1535-1545 and was derived from the word vuist which is used in the Dutch dialect. Foist can be recalled by splitting it as ‘forcefully insert’ which would mean to forcefully impose and thus is easy to relate to. 1. The film just lets us sit back and smile, never foisting any messages on us and avoiding the usual annoying sentimentality. 2. Being my superior he gets to foist all his work on me whenever he has a deadline to meet. 3. Shopkeepers who foist shoddy souvenirs on unsuspecting tourists should be dealt with harshly.